The Great War continues to fascinate us all. In this original approach, prize-winning historian Peter Stanley cleverly weaves his narrative around striking images—many never seen before—to create a visual history that immerses the reader in each moment. Peter has selected documents, photographs, artefacts, and images—drawings, prints, postcards, advertisements, souvenirs, song-sheets, posters, leaflets, maps, and cartoons—which together tell stories of battles overseas with Turks and Germans, and battles at home, for and against conscription, over ‘loyalty’ and ‘disloyalty’, and the war’s many imposts on Australia’s people. The National Library’s war memorabilia and documents help to connect the conflict overseas with the equally bitter struggle at home. Men faced life-changing choices: volunteer to fight or stay at home; join the industrial battles for hard-won working conditions or break the strikes. Women bore the burdens of voting to send men to their deaths, of raising children on their own, of waiting and worrying. As communities fractured under the stress, even children were drawn into the animosities between ‘German’, ‘Irish’, and ‘British’ Australians. 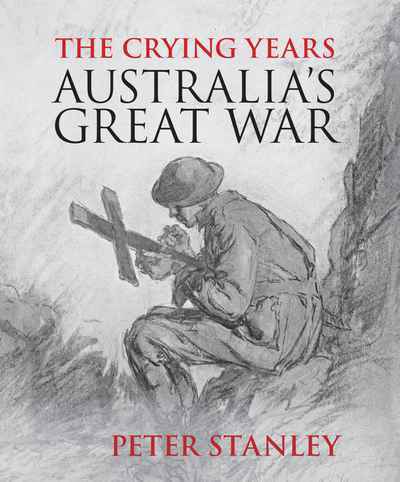 The Crying Years evokes the drama and tragedy, suffering and sacrifice, the pain and the pity, of Australia’s Great War.